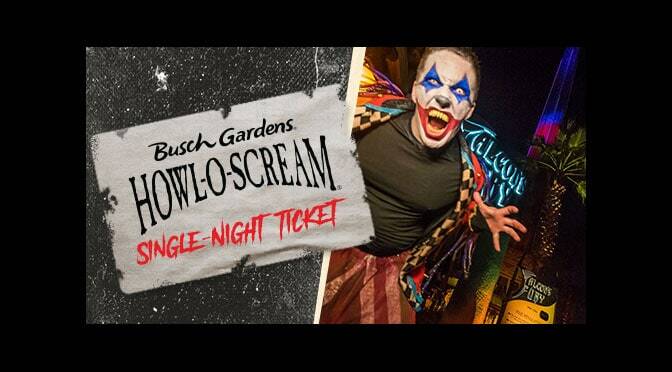 Get Busch Gardens Howl-O-Scream tickets for only $29.99 if purchased this week! TAMPA, Fla. (August 10, 2017) – For one final week, tickets to Howl-O-Scream 2017 are available at the absolute lowest price of the season for only $29.99. Brave a visit to Howl-O-Scream 2017 during 19 select nights between September 22 and October 29 at Busch Gardens Tampa Bay. Brave 1 visit to Howl-O-Scream on any event night, select dates Sept. 22-Oct. 29, 2017 at Busch Gardens Tampa Bay. Valid for 1 visit on any Howl-O-Scream 2017 event night after 5 p.m.
Howl-O-Scream starts at 7:30 p.m. each event night, but this ticket allows access to the park starting at 5 p.m.
Howl-O-Scream is a separately-ticketed night event. Tickets are valid for one event night only. Prices are per person, and do not include parking, taxes or service fees. Advance purchase prices are available online or by calling 813-884-4FUN. Discount not available at the front gate. Annual Passes are not valid for entry. Howl-O-Scream 2017 tickets are subject to availability. Limit one in-park upgrade per paid individual admission. Howl-O-Scream 2017 ticket is not valid for general day admission, tours or dining. Not valid with any other discounts or offers. Operating hours are subject to change without notice. No guests in costumes admitted. No rain checks or readmits. Tickets and Passes are non-refundable. Get ready for guts, gore and a night of seriously sinister fun. Previous PostHow I met 56 characters in one day – Disneyland Character Locator Challenge July 2017Next PostWin Lularoe leggings for a year!